Did you know that there are several calculations, like enthalpy and dew point, built into Computrols Building Automation Software that simply require you to choose existing points like humidity and temperature? First, add an Analog Input software point to any controller. On the program screen of that point, click Program Calc. then Insert Row. Choose “Set Value of Software Point” then “Calculation” and you will see a list of possibilities (below). Choose one and you will be prompted to select the input points for the calculation. Note: In order to remove a point, you must be in Editor Mode. It is recommended that you remove any logic, PID, etc. that resides on or is related to the point being deleted. 1. From the Main menu, click Database and click Remove a Point. 2. The list that appears is in the same order as Text View-All Points. Find the point either by scrolling or searching. 3. Select the point and you will be asked twice if you are sure you want to delete the point. If you are sure, answer Yes. You will no longer see the point in Hardware View or Text View. Did you know that Holiday Schedules execute from the controller and not the DPU? 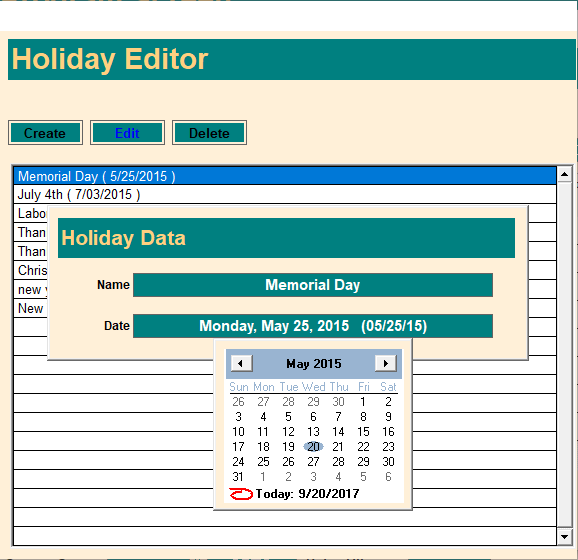 When you add a holiday to any point in CBAS, it is added to every point that has a schedule programmed. That change then automatically downloads to every controller. It is suggested that on the first of each year, that you change the dates of past holidays rather than creating new holidays to avoid an excessive number of entries.